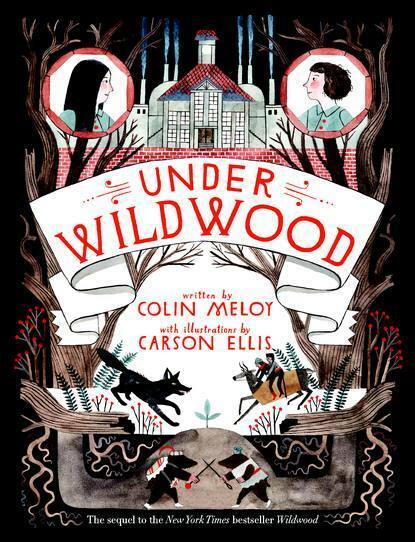 This sequel to Wildwood by Colin Meloy (and beautifully illustrated by his wife, Carson Ellis) is another tour de force that completely and utterly sucked in my 8 year old son and I as we experienced it as a read-aloud. In fact, after reading the first Wildwood to myself and then as read-aloud to my son, I think this is one of those books whose words and whose story needs to be your lips to treasure and experience with others. Where Wildwood introduced us to Prue and Curtis, and the imaginative land of the Impassable Wilderness just outside of Portland, Under Wildwood continues the saga when Prue goes back to the wilderness (Curtis had remained at the end of the first book, joining in with a band of bandits), and is given a prophecy that will drive the story into the third and final book (I hope he is writing that right now. You hear me, Meloy? I HOPE YOU ARE WRITING IT RIGHT NOW!). We also meet Curtis’ sisters, who are on their own adventure on the outskirts of the Impassable Wilderness. I won’t go into all of the fascinating twists and turns of Under Wildwood, except to say that there is plenty of action and suspense to keep even the most reluctant reader satisfied and calling out for more, and plenty of depth of characters here that keep getting more complex as the story weaves itself together in various strands. I highly recommend this book for read-aloud, and for middle school independent readers seeking an adventure. You won’t be disappointed.